Here, copper is dissolved (oxidized) at anode and deposited (reduced) at cathode. This is the basis of producing pure copper from impure copper. Large scale production of many metals is carried out using this process. First Law: The amount of chemical reaction occuring at any electrode during electrolysis is proportional to the quantity of electricity passed through the electrolyte. Second Law: The amounts of different substances liberated by the same quantity of electricity passed through the electrolytic solution are proportional to their chemical equivalent weights (Atmoic Mass of Metal + Number of electrons required to reduce the cation). In this reaction, one mole of electron is required for reduction of one mole of silver ions. Products of electrolysis depend on the nature of material being electrolysed and type of electrodes being used. 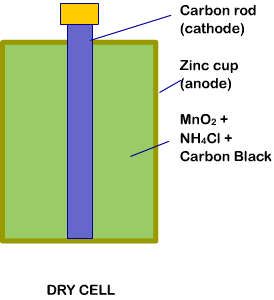 If the electrode is inert, it does not participate in chemical reaction, but reactive electrode participates in the chemical reaction. Product of electrolysis also depend on different oxidizing and reducing agents present in the electrolytic cell and their standard electrode potentials. There are two main types of batteries, viz. primary batteries and secondary batteries. Mercury Cell: It is used for low current devices. It consists of zinc-mercury amalgam as anode and a paste of HgO and carbon as cathode. A paste of KOH and ZnO is used as electrolyte. Following reactions take place in mercury cell. A secondary cell can be recharged by passing current through it in the opposite direction, and thus can be reused. Lead storage battery is the most common secondary cell. It consists of a lead anode and a grid of lead packed with lead oxide (PbO2) as cathode. A 38% solution of sulphuric acid is used as electrolyte. 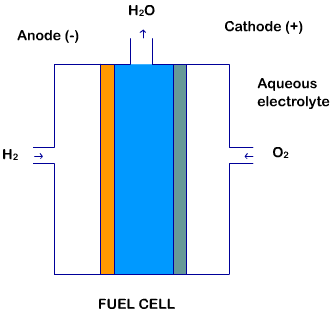 Following reactions take place in this battery. Galvanic cells which are designed to convert the energy of combustion of fuels directly into electrical energy are called fuel cells. One of the most successful fuel cells uses the reaction of hydrogen to form water. In the cell, hydrogen and oxygen are bubbled through porous carbon electrodes into concentrated aqueous solution of sodium hydroxide. Catalysts (palladium or platinum) are incorporated into electrodes to hasten the reaction. Following reactions take place in this cell.